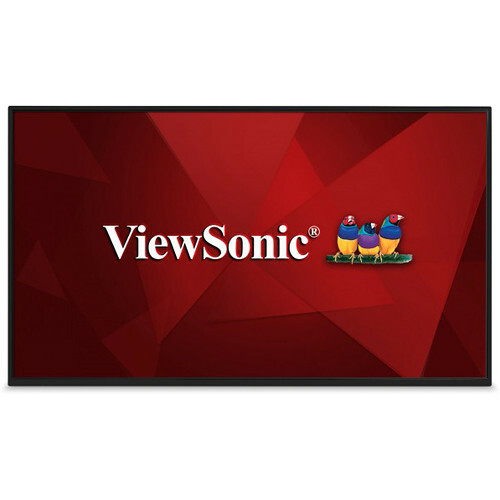 With a built-in quad-core media player and 16GB of on-board storage, the CDM4300R 43" 16:9 Large Format Commercial Display from ViewSonic is designed to be an all-in-one digital signage solution. With the 16GB built-in storage it is easy to upload multimedia content to be displayed while the internal scheduler determines what to display and when. This commercial display also comes equipped with embedded LAN and Wi-Fi connectivity to connect to a local network to stream content directly to the display. The CDM4300R Large Format Commercial Display features a Full HD 1920 x 1080 resolution, along with a 1100:1 static contrast ratio and a 12 ms response time offering enhanced clarity and image quality. Setup and configuration of this display is simple as it comes equipped with HDMI, DVI-I, DisplayPort, RCA, RS232, Ethernet, and USB connectors. An integrated RJ-45 connection, as well as Wi-Fi capabilities, provide easy network connection options for content streaming. An integrated browser provides simple content delivery via connection to the web. Box Dimensions (LxWxH) 45.0 x 30.0 x 8.0"